Released in a gatefold cardboard sleeve with silver front image and lettering. All songs published by Cage Music/Cobalt Music Publishing, except 'Say it to me' published by Cage Music/Kobalt Music Publishing/Elodine Songs Ltd/Warner Chappell Music Ltd. 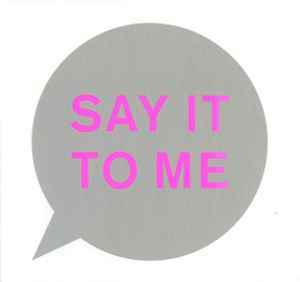 I was really surprised when they released "Say It To Me" as the 3rd single of the album "SUPER". I thought "Groovy" or "Undertow" even "Into Thin Air" were more obvious choices for single releases. But like everytime with PSB, the B-sides or extra tracks of the single are top notch. I love ALL four tracks on this fantastic new Pet Shop boys CD maxi! These guys just keep on putting out solid dance/ pop and theres not stopping them!! I loved the PSB since they first burst on the pop scene way back in 1984!